Stéphane Chrétien spent eighteen years of his career working in market activities at the Société Générale Group. He started in the Treasury Department in Luxembourg before moving to Hong Kong in 1997, where he was in charge of Société Générale’s cash management and forex activities. After joining Société Générale Bank & Trust in Luxembourg in 1999 as head of capital markets, from 2000, Stéphane set up an expertise centre on derivative strategies and structured products for SG Private Banking. In 2002, he was also given the responsibility of developing the Société Générale group’s private banking activity in the Middle East. In 2006, he took part in the creation of Compagnie de Banque Privée in Luxembourg, now CBP Quilvest. 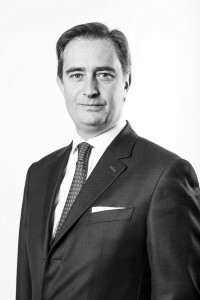 A member of the Management Committee, he was notably in charge of market activities before being appointed Chairman of the Management Board of the present Quilvest Banque Privée in 2011, of which he then became CEO. The 1st February 2018, Stéphane stepped down as CEO of QBP and succeed the 1st April 2018 as the new Chief Executive Officer of QVS based in Switzerland, Zurich. Stéphane is also a Member of the Executive Committee of Quilvest Wealth Management.